Open the door to the vacation of your dreams. 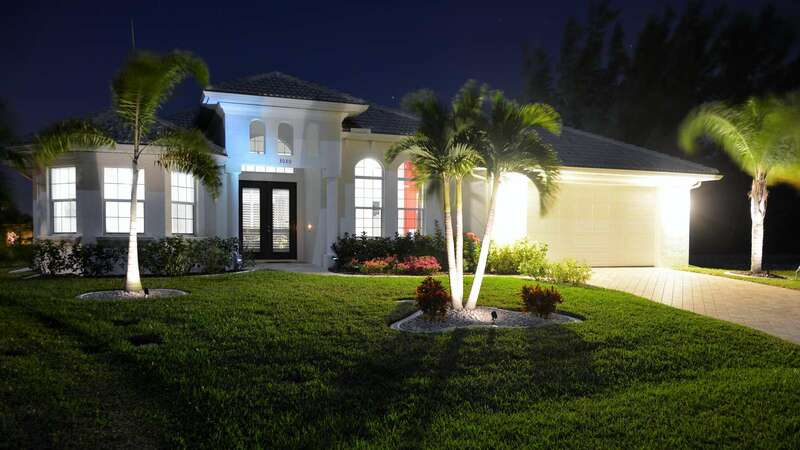 Behind it you will find a Wischis Florida vacation home central in Cape Coral, clean, modern with a large pool, even larger pool deck and Southwest exposure. You like the privacy a large canal behind a house brings with it? The water view it gives you? You like to see the fish jump, all sorts of different birds take flight and perhaps see the occasional alligator swim along? Then the home is the perfect vacation house for you. Close to shopping and entertainment, yet still in a quiet and peaceful neighborhood this vacation home has all the conveniences you might expect from a great vacation home. 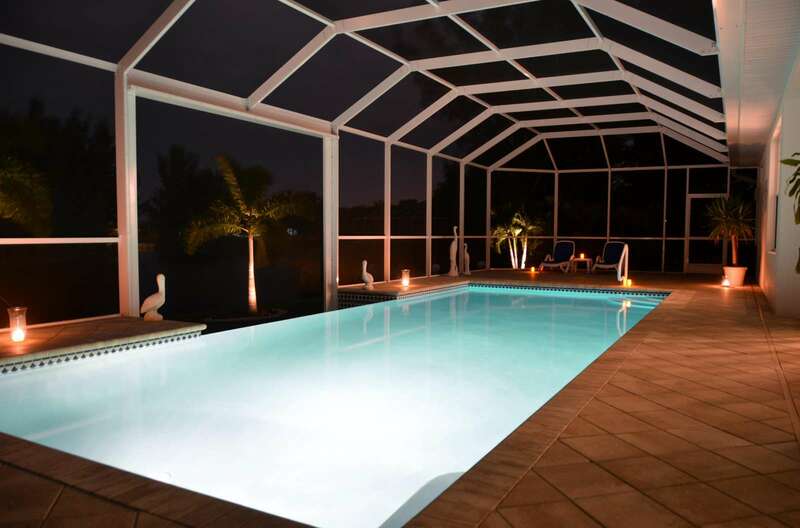 The grand pool at this home is made for swimming daily rounds and what better way to work off some of these vacation calories we all get during the most fun time of the year? Speaking of calories, the lovely kitchen is equipped with all the appliances and dishes you might need while still enjoying the view of the pool area and the canal. And because one can never have enough of a nice view, you will also get it from both, equal in size master bedrooms. This property has 3 King(s). House was exactly as described and pictured! Coral Palms was very clean, which is important to me, I am a neat freak and can be critical of the cleanliness. Marco was easy to deal with and very accommodating. Pool was beautiful, and if you want to pay a little extra and keep it very warm it is definitely worth an extra $35 or so, in winter that makes it much nicer. Location is great and close to most things you would need, about a 15 minute drive to the Harbour. The only downfall to this home are the limited channels available on tv, not a huge ordeal because you are on vacation, but with teenagers just thought it be worth mentioning. Wi-Fi is available and there are HDMI cables there so if you bring a laptop you could watch whatever you wanted. Great vacation! Would definitely rent from Wischis again! Perfect house with everything you need and more. The house was almost better than the pictures. It was very clean and had everything. It was good organized with all the information you needed. The pool was really nice and clean. The kitchen was fully equipped. We just love the place! Nothing to complain about at all but you definetely need a car cause it is far away from sightseeing, malls and supermarkets.